The Azores, an archipelago in the Mid-Atlantic, are often overlooked for their amazing whale watching potential. So much so that those of us in the know often have the whales all to ourselves. I'd definitely like it to remain the case, so if I tell you about the Azorean magic will you promise to keep it to yourself? This year the Azores were witness to possibly the largest baleen whale migration in recent history. Think of the rich Azorean waters as a whale snack shop, where they stock up on nutrients before heading north to the cold feeding grounds. Late April and early May tend to be the best times to catch the whales hanging out having a nibble or two. This year unprecedented numbers of whales were observed and they stayed way past their usual curfew. If you're keen to have quality sightings of multiple species of whales the Azores has got to be the place to go. During my trip in May I observed blue whales, fin whales, sei whales, humpback whales and sperm whales. Most of these species were ticked off my list in 24 hours, but for me it's the behaviours that I love observing most. As I was usually on the only observation boat out with the whales their behaviours weren't disturbed and were as natural and amazing as one would ever see. On one boat trip I saw three fin whales being approached by a fourth who proceeded to skim at speed over the top of the other whales launching himself out of the water. The energy and drama of the scene took my breath away. Another day a blue whale was seen being pursued at speed by two fin whales, potentially trying to mate. I'm told that it has been known for blues and fins to mate producing hybrid calves. Later in the week a humpback was observed hanging out with a sperm whale and its calf. A curious, cheeky humpback that appeared to be coaxing them to play with no success, or was it harassing them? With such unusual interactions you never really know the intention of the behaviour, but you can have fun guessing. There were so many blue whales revealing their tail flukes as they dove, a behaviour that is only usually seen in about 15 to 20 percent of blue whales, that it became something I started to take for granted. My favourite encounter was the day a fin whale made me short circuit: a group of four fin whales had been sitting by the boat for a couple of hours, travelling very slowly and consistently at the side of us. It was very unusual not to see them charging through the water or diving; they were content just being with us. In fact they were insistent on being near us even though we attempted to observe a larger ethical distance. Distance would have also been preferable to avoid the smelly vapour of the whales breath coming out of the blow hole at speed and blowing immediately into our faces. Think of the worst compost you've ever smelt and multiply it by ten, only it's wet and it's on your face and in your mouth. I moved to the bow of the boat to avoid some of the toxic whale breath and looked into the deep Atlantic water to hopefully see a sun fish, blue shark or turtle. What happened next no one could have predicted. As I looked into the ocean, the nose of a fin whale slowly glided forwards from under the boat only a few meters below me. It had been sat perfectly aligned under the shell of the boat. As it continued to glide forward I adopted the sophisticated reaction of squealing like a banshee in excitement. It was close and it was huge and it continued to glide, and it continued and continued. Looking down on it from such a short distance above gave a new perspective to the beauty, grace and size of this majestic creature, which had made a special effort to take a peek at me! I was entranced and enthralled until I had the sudden notion that if it arched its back to dive it would capsize the boat. At the same time as my realization, the whales blow came to the surface and the skipper suddenly realized what I had been squealing at. We all braced ourselves and I have a faint recollection that my squeals of excitement had turned into an actual scream. We all held tight for what seemed like an eternity but nothing happened. I peered back over the bow and there she was, just gliding forwards. On and on and on she went until her perfect fluke glided under me carrying a cargo of dancing sunlight. It appeared that this beautiful leviathan knew exactly where we were and I now believe there is no way she would have tipped our boat. A sentient being, without a doubt. Standing up to manoeuvre back to my seat was somewhat difficult with knees of jelly. I had officially short circuited during this amazing close encounter and for hours later all I could say was "Oh my goodness" (well, maybe I said something a bit stronger!). I couldn't absorb anything that anyone said to me and was so euphoric that I thought my head might burst. Then I had the awful realization that my fin whale was eventually going to leave the haven of the Azores and would be heading to the Icelandic whale hunting grounds to feed in the rich cold waters. What a sad thought to think that my fin whale, who had spent so much time hanging out with us humans, might no longer be with us due to the actions of our own species caught up in the insane whale hunting industry. A tragic and horrendous thought, which has stayed with me. The Azores is a safe haven for whales and I like to think that they spent so much time hanging out in the Azorean waters this year because of the lack of harassment. 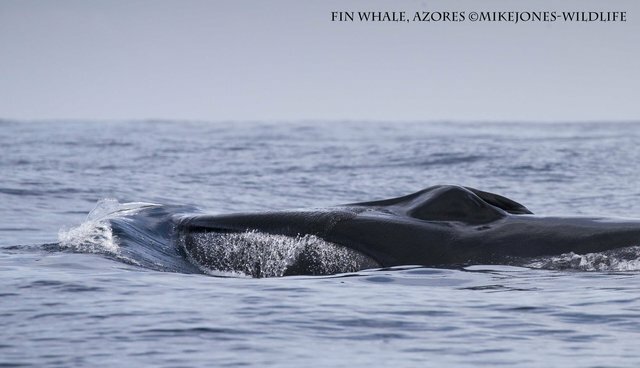 If you want to see lots of whales and intriguing natural behaviours go to the Azores for the baleen whale migration, but don't tell anyone, it's a secret!